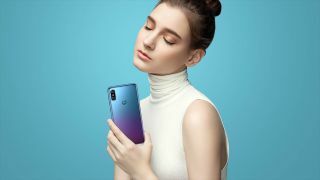 In an attempt to make a splash on the Chinese smartphone market, Motorola has launched its new P30 mid-range handset in the country with a distinctly Huawei-esque color option. Available from today, the P30 (even its name makes it sound like a Huawei P20 successor) will be available in three colors: Bright Black (oxymoron), Jade Ice (it's white) and Aurora (which is exactly like the Huawei P20's gradient-sporting Twilight color in everything but name). You can check out the Motorola P30 in its various color options below. As is customary with mid-range Android smartphones in 2018, the Motorola P30 has an iPhone X-inspired notched display and minimal bezels, with its FHD+LCD display (19:9 aspect ratio) backed by a Qualcomm Snapdragon 636 processor and 6GB of RAM. It's also got a 16MP + 5MP dual camera setup on its rear, a 12MP selfie camera on its front, a 3,000mAh battery, and is available with either 64GB or 128GB of internal storage with the option to expand via its microSD card slot, so at least it's got that over the Huawei P20. While the phone is named the Motorola P30 in Asia, it looks identical to the previously-reported Motorola One Power, which is expected to hit Western markets in the very near future.